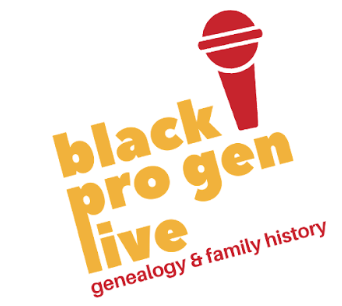 Durham-Orange Genealogical Society. North Carolina. 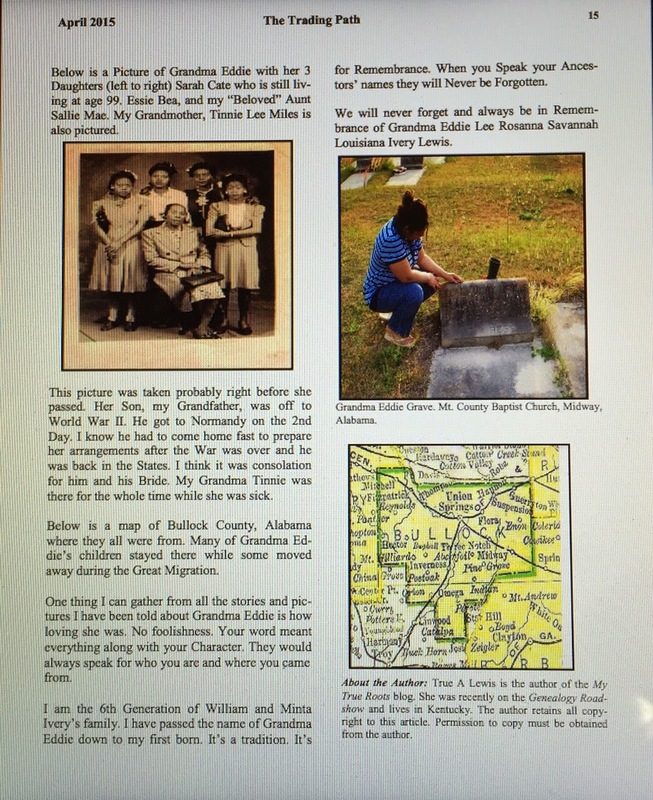 Durham- Orange Genealogical Society Publishes a Monthly Publication for their Society called: Trading Path Journal. I was Sincerely asked by Ginger Smith the Vice-President of the Chapter. If I would like to submit a Story for their Black History Month Issue. It was Accepted and Published. For April 2015/ Volume 23 Issue. Thank You! to the Editor Ginger Smith! 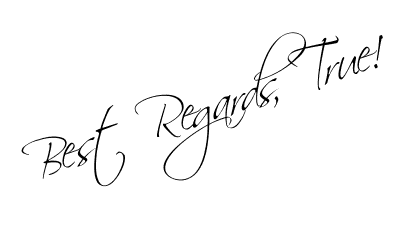 of Genealogy By Ginger and Editor of the Trading Path Journal, for allowing me to step out of my comfort zone and walk me through the whole process. It was a learning experience. I'm very pleased at her patience and time. Especially the Editing! 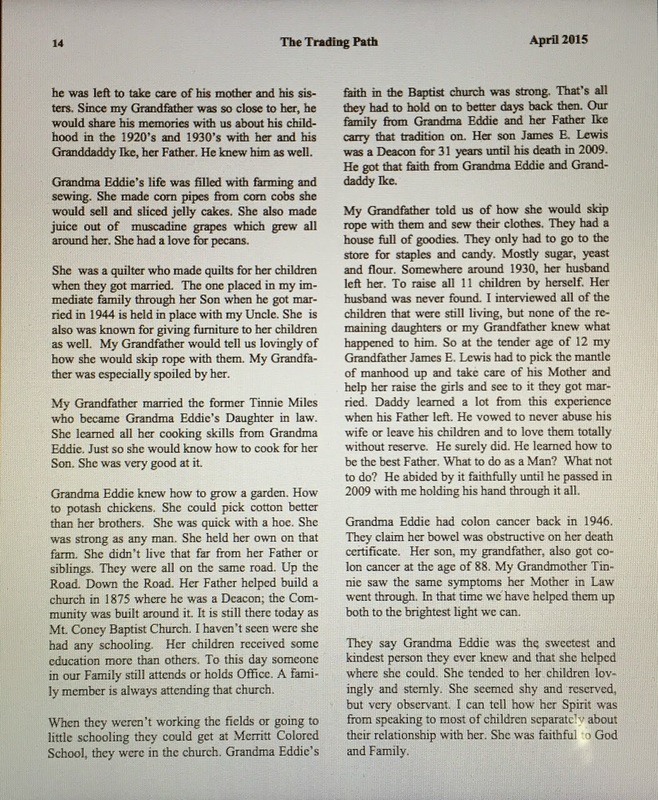 It is written by D-OGS : It States in Closing Opening remarks : "Lastly, we have a story about one Woman's family member who was a Inspiration to her and many others her entire life". True A. Lewis of the My True Roots Blog. 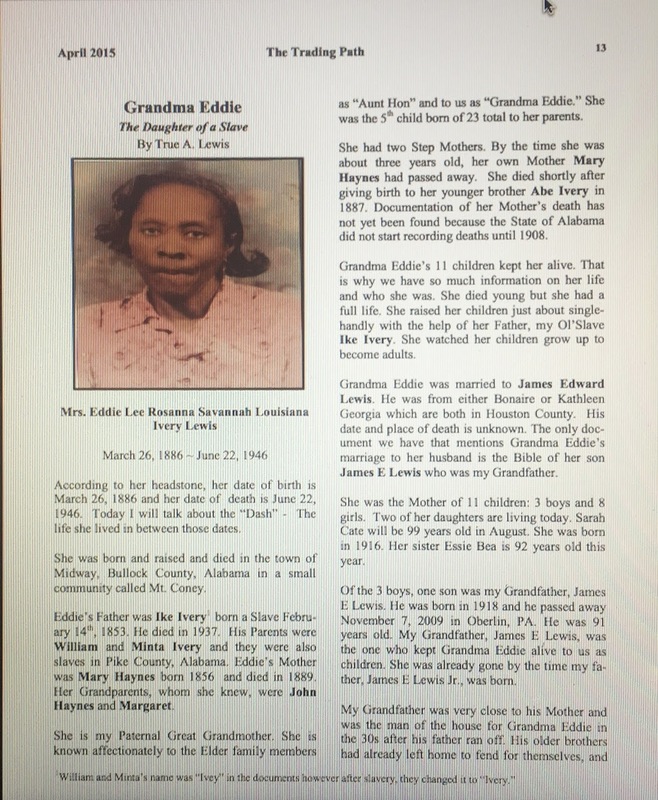 Writes of her Paternal Great Grandmother Eddie Lewis who is the Daughter of a Slave. My BlogSisters Schalene & Cathy are also in this Issue! for their Contributions on Slavery as well. I retain all Copyrights © to this Article. 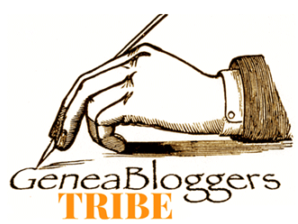 Written Permission must be Granted and Obtained from True A. Lewis, Author. For use. All Rights are Reserved. Labels: Trading Path Journal. Durham-Orange Genealogical Society. Ike Ivery.